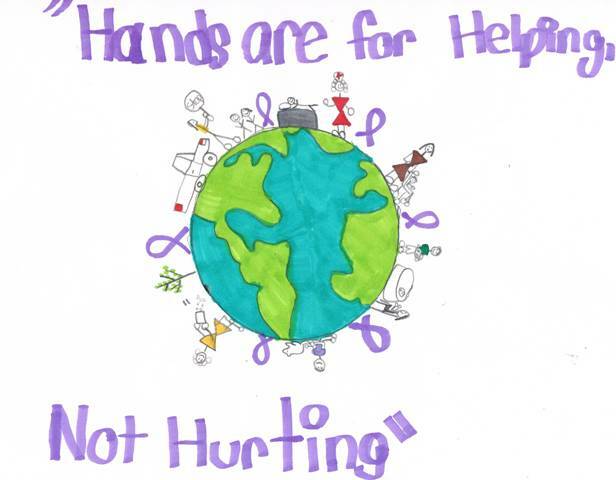 The art contest also gave the parents, teachers, coaches or group leaders of the youth participating the opportunity to talk about what the phrase “Hands are for Helping, Not Hurting” means, discuss behavior expectations, and emotions associated with helping hands not hurting hands. The contest, which was free to enter and open to youth ages 5-12 living in Northeast Florida, is held annually as part of Hubbard House’s violence prevention efforts through its W.A.V.E. (Working Against Violence Every day, Everywhere, Every time) program. The prevention program teaches youth healthy relationship skills before abuse occurs, how to identify and prevent bullying, and helps them gain a better understanding of how violence affects their lives. In fact, it is estimated that about 56 percent of all students have witnesses a bullying crime at their school. Children between 4th and 8th grade are a greater risk for bullying; 90% were reported as victims of some kind of bullying. Tucker will receive a Playtime Party Package from Adventure Landing – Jacksonville Beach, for 8 guests. All honorable mentions will receive a Certificate of Achievement. In addition, the artwork of the grand prize winner and honorable mentions will be featured online at www.hubbardhouse.org/news-events/ and www.facebook.com/hubbardhouseinc, in an upcoming edition of Hubbard House’s newsletter, and at various events throughout October, Domestic Violence Awareness Month. Some of these events include the 2011 Domestic Violence Awareness Month Press Conference, the 17th Annual Barbara Ann Campbell Memorial Breakfast and the October Art Walk in downtown Jacksonville. One form of domestic violence is economical abuse. Too often abusers refuse to share money with the victim, control all of the money, and do not allow the victim to have a job. Abusers also deny the victim access to money or the means of obtaining it, to the point that she is entirely dependent on the abuser for food, clothing and shelter. Another act of power and control over the victim is forbidding her from maintaining a personal bank account. Helping victims of domestic violence gain employment will give them financial independence. According to a study conducted by the National Network to End Domestic Violence, domestic violence victims often cite lack of employment and financial security as barriers to leaving an abusive relationship. Many abusers control the relationship by limiting the victim’s access to financial resources and employment. Too often victims must choose between staying in an abusive relationship or facing economic hardship when leaving. Currently, Hubbard House victim advocates (case managers) serving shelter and outreach clients are limited with their time and are unable to devote enough resources to helping clients research job opportunities, create strong resumes, apply for jobs, prepare for interviews by practicing interview questions or provide assistance with dressing appropriately for interviews. It is our desire to have a person dedicated to helping women establish careers which will help empower them and provide financial independence. By helping victims find and maintain employment we will have a sustainable impact on their ability to have financial independence and an opportunity to live a life free of violence. Hubbard House is partnering with the COACH Foundation to make this program a reality. The program will be the COACH (Creating Opportunities And Career Help) Program and we are currently in the hiring process for a Job Specialist. The Job Specialist will work directly with Hubbard House program participants with career development, resume formation, interviewing, and helping prepare for applying for jobs. The Job Specialist is also responsible for developing community collaborations to advance job opportunities for victims of domestic violence. For the full job description please visit: http://hubbardhouse.org/about/jobs/. Last year, Hubbard House provided shelter for more than 1,000 women, children, and men who were victims of domestic violence. When a victim leaves their abuser, there may be no time for packing and planning the escape. Sometimes families come to shelter with nothing but the clothing they are wearing. Hubbard House provides them with food, clothing, linens, toiletry items; whatever is needed until they can provide for themselves. When entering Hubbard House’s emergency shelter, victims have not only found a safe haven, but also a place that gives them an opportunity to rebuild their life and start fresh. It is often important for victims to reside in a place similar to a home. To aid the healing process further, it may also be crucial for victims and their children to still be able to sit down and enjoy a family dinner together. Therefore, Hubbard House provides victims with access to a stocked pantry for all their daily meals and snacks. In order to do so, however, Hubbard House relies heavily on the generosity of the community to keep the pantry stocked with both non-perishable and perishable* foods. At this point in time, Hubbard House is running low on food due to the current economy, resulting in budget cuts and declines in food donations. Thus, food donations from the community are incredibly vital in helping keep the pantry stocked. On average, Hubbard House has more than 80 women and children staying in shelter. No matter how big or small, any donation makes a difference and is greatly appreciated. 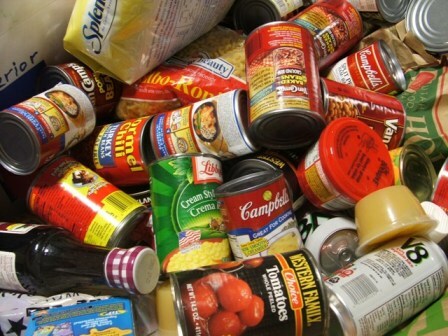 If you are interested in organizing a food collection drive, through your place of employment, with your family and friends, or through your civic or church group, to benefit victims of domestic violence and their children, please contact us at donategoods@hubbardhouse.org or 904-354-0076 ext. 301. *Perishable foods (milk, eggs, butter, meats and cheeses) do not have a long shelf life; gift cards to various supermarkets are preferred.